Pillow Inflatable Size(LxWxH): 14"x12-5/8"x3-7/8" (36x32x10cm); Deflation Size(LxW): 16"x10-3/16" (41x26cm). 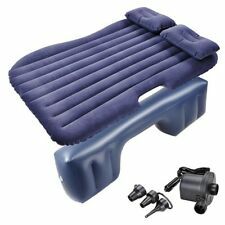 1x Inflatable Bed. 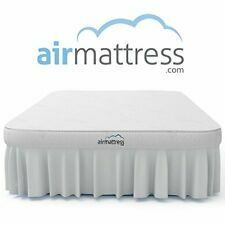 Durable inflate mattress, provide a soft and comfortable texture feeling. Color: Vansta Dark Blue. Ikea Henriksdal Bar Stool Removable COVER ONLY (Chair is NOT Included). Machine wash warm, normal process. The cover is easy to keep clean as it is removable and can be machine washed. Ikea Norsborg 2 Seat Sofa. This cover is made by Ikea to fit only the Norsborg 2 Seat Sofa. Cover in the Edum Dark Blue Color. The IKEA number is 003.040.87. SLIPCOVER and NOT the FURNITURE. 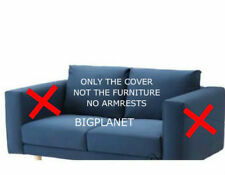 This is the complete slipcover without the armrests. Fits Most Standard Loveseat with Elastic Band Under Seat Cushion. Color: Navy. Colors Available: Black, Brown, Burgundy, Charcoal, Gray, Navy, Purple, Sage, Sand, Taupe. E-Z Foldz Step Stool - . Available in a variety of colors. Colors include red, blue,yellow ,green, black ,burgandy ,forest green ,saphire blue, and white. We make airbeds look good! We include a fitted bed skirt that not only makes your airbed look great, it provides a layer of comfort and warmth to counter the discomfort of sleeping on a cold vinyl bed. You will receive 1 Ikea Norsborg 3-Seat Sofa Slipcover. (NO ARMRESTS). Fits:ONLY IKEA Norsborg 3-Seat Sofa Section. Color: Edum Blue. IKEA Norsborg cover for three-seat sofa section. Color: Edum (light blue). New in Box, box has been opened for picture purposes, item never taken out of the box. Original box has shelf wear. The box includes 1 Pc Product, 1 Pc foot pump. Decor & Organization. The perfect way to bring an industrial style to any room. Why Choose BuildInc?. Product Weight: 36.1 lbs. Width: 23-1/2". Height: 31-3/4". HAGEBY BLUE cover for IKEA KLIPPAN footstool. Footstool not included. Design and Quality: IKEA of Sweden. People ride bikes for a variety of reasons. Others are in it for the lifestyle. Most just want to be healthy and have fun! Whatever your reason, we're here to help. Here at Bikewagon, we know that life is so much more than a low price. Protect your sofa with the Sure Fit Non-Slip/Waterproof Furniture Cover. This cover is great for kids and pets. It has a simple 1-piece design which makes it easy to put on and take off your furniture. Item is new in box.Mattress Min.Order is 1 case ( 4 In Each Case ). An exclusive two-part safety valve system and double interlocking sealing valve prevent leaks. Heavy-gauge vinyl is bacteria and odor-resistant and easy to clean. Brand new in original unopened packaging; $144.99 Value!! This will only fit the Ikea Klippan Loveseat. - The cover is easy to keep clean as it is removable and can be machine washed. Machine wash, warm, normal cycle. The fabric does not stretch and is not adjustable so it will not fit other makes and models. Total sitting area is 21” Seat width for our other sizes. (Sofa Extra Wide) up to 74“, (Sofa) up to 66”, (Recliner) up to 26“, (Loveseat) up to 21“. PREVENT SLIDING - Elaine Karen Couch Covers feature a 2” thick adjustable elastic strap to help prevent sliding. Finish: Aged Brass. Skin Care, Bath & Body (73). So why buy from us?. And our friendly and knowledgeable phone staff is available 24-7! Are you a designer or builder with a large project?. Want to buy for less?. Color: Navy. Colors Available: Black, Brown, Burgundy, Charcoal, Gray, Navy, Purple, Sage, Sand, Taupe. Fits Most Standard Armchairs with Elastic Band Under Seat Cushion. Made in Italy by B-Line, signed. Part of the Museum of Modern Art in New York permanent modern art collection. THESE STOOLS HAVE A BACK ON THEM AND CAN SWIVEL. THERE ARE TWO RINGS AROUND THE BOTTOM OF THE LEGS. THERE IS INSTRUCTION ON HOW TO PUT THEM TOGETHER. THEY ARE ONT HARD TO PUT TOGETHER. IKEA NORSBORG Series Armrests Slipcover. Fits only Norsborg Series Armrest. Edum Light Blue. Fits armrest size: W6¼×D34⅝×H20½"/. ARMREST COVERS ONLY. Armrest NOT included. THE COZY WATERPROOF-FLOCKED SURFACE IMPROVES COMFORT AND PREVENTS SHEETS FROM SLIPPING. THE EXTRA-WIDE OPENINGS ON THE 2-IN-1 VALVE MAKE INFLATING AND DEFLATING QUICK AND CONVENIENT. FOLDS COMPACTLY FOR STORAGE OR TRAVEL.